When you and your family are spending a lot of time on your sport court flooring playing all sorts of games, it is important to eat healthy to fuel your body. Look into these healthy snacks that will keep your family playing for hours on end. An easy snack you can enjoy while your kids are taking a break from the home basketball court is apple cookies. The bonus is that you only need three ingredients to create this treat. Grab some Granny Smith apples, peanut butter and mini chocolate chips. Cut the apples up into thin circular slices and spread some peanut butter on them. Finally comes the sweet treat part—sprinkle some chocolate chips on top. This is a tasty snack that will refuel energy and your kids are sure to love. Peanut butter roll-ups are also an easy snack that will fuel your kid’s energy. It only takes four ingredients and ten minutes. Grab some bananas, flatbread, peanut butter and honey. Spread peanut butter on the flatbread. Slice up the banana and spread it across the flatbread; thin slices work better. Roll up the flatbread with the peanut butter and bananas. This is a quick and easy snack filled with good nutrients. Sweet potato chips are also a quick snack to make. This energy filled food is perfect to enjoy between games on the sport court flooring. First, cut up a sweet potato into thin slices. You can choose how you want to flavor your sweet potato chips. When you’re dealing with your children, sprinkling the sweet potatoes in cinnamon and sugar is key. Put them in the oven for 20 to 30 minutes at 375 degrees. When taking them out of the oven be sure the chips are tender yet crisp. 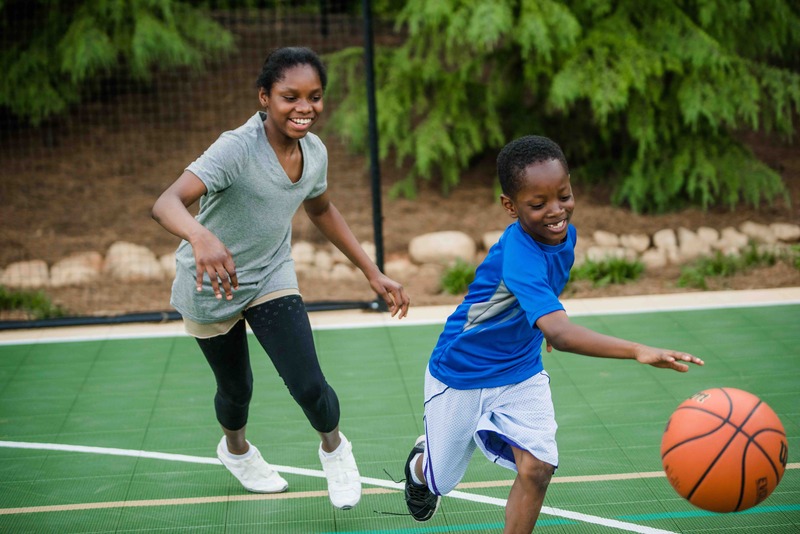 You shouldn’t have to limit your time spent running up and down your sport court flooring. Keep your team fueled and hydrated with these simple tricks.